Today I want to talk about fruits and veggies (and yes, we do actually eat those here in Italy – it can’t be pasta and gelato all of the time). Italy offers a wonderful selection of fruits and vegetables. The majority of the produce is local (grown in Italy) and vine ripened which means it is bursting with flavor. 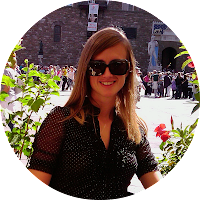 One of my favorite things when I first arrived here in Italy was going to the fruit and vegetable markets and checking out all of the fruits and vegetables that I have never seen before. I would love to highlight some of my experiences with these new fruits and veggies, what I learned about them, and how I like to prepare and eat them! Right now, being in the middle of winter means we are also in the middle of bitter greens season. The Italians love their bitter greens. There is always an impressive display at the market from arugula to radicchio to dandelion greens and puntarella. There are never less than four different kinds of bitter greens at every market stall. 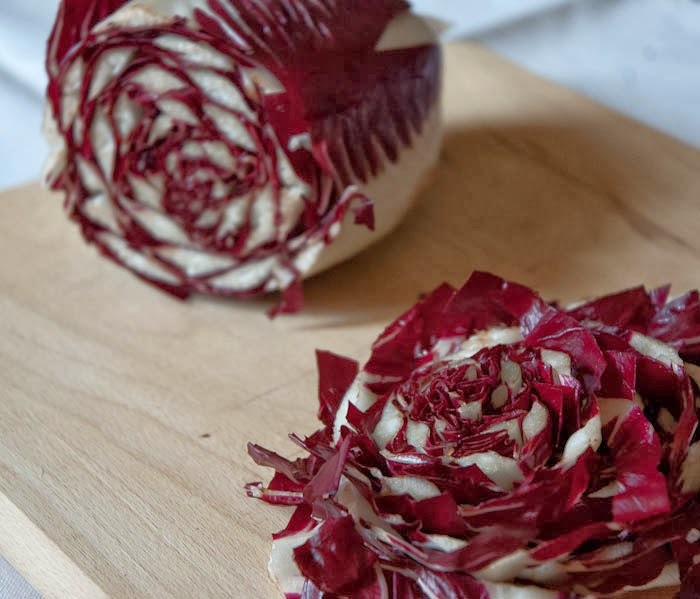 I was immediately attracted to the radicchio which is a beautiful deep purple color with contrasting white veins. There were different shapes too! Round ones that resembled a grapefruit in shape and long narrow shaped ones more akin to a submarine; the former is actually called Chioggia and the latter Treviso, named after the area in the region of Veneto where they are traditionally grown. I had radicchio for the first time at a restaurant where it was grilled and served as a contorno (side dish). It was offensively bitter! I remember choking it down and thinking something must be wrong with the Italians around me who were so eagerly eating it. Over the years, I tried over and over but just couldn't get a taste for it. Finally, this year things have started to change. 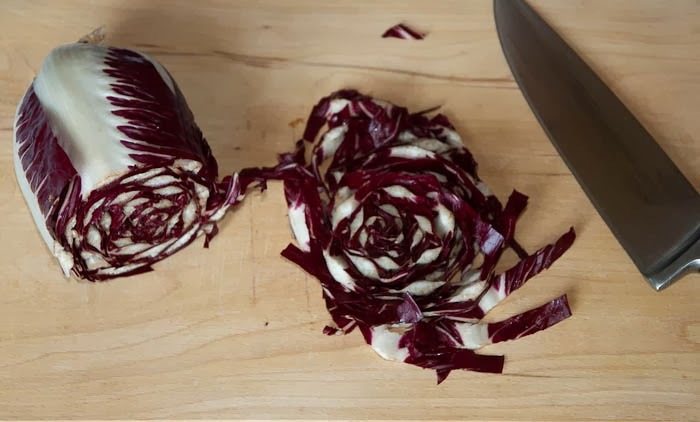 I realized that the strong bitter taste of radicchio is best tempered with a sweeter ingredient to help balance out the taste. I now enjoy it both raw and cooked. Each Saturday when I head to the Farmer’s market it is always one of the first things in my bag. For lunch I like to eat it raw in a salad. I always buy radicchio and lettuce and make a greens mix. I find the lettuce helps to keep the radicchio from being too overwhelming and the radicchio gives a punch that the more tame lettuce fails to provide. My absolute favorite salad of late, that I have been eating every day for the last 2 weeks, is a mix of chopped lettuce and radicchio tossed with olive oil, balsamic vinegar, salt and pepper and then topped with a sliced pear (use a firm variety), chopped walnuts, and Parmigiano. So easy and so satisfying – the best kind of lunch!